New Mars research shows evidence of a complex mantle beneath the Elysium volcanic province. Mars' mantle may be more complicated than previously thought. In a new study published today in the Nature-affiliated journal Scientific Reports, researchers at Louisiana State University (LSU) document geochemical changes over time in the lava flows of Elysium, a major martian volcanic province. LSU Geology and Geophysics graduate researcher David Susko led the study with colleagues at LSU including his advisor Suniti Karunatillake, the University of Rahuna in Sri Lanka, the SETI Institute, Georgia Institute of Technology, NASA Ames, and the Institut de Recherche en Astrophysique et Planétologie in France. They found that the unusual chemistry of lava flows around Elysium is consistent with primary magmatic processes, such as a heterogeneous mantle beneath Mars' surface or the weight of the overlying volcanic mountain causing different layers of the mantle to melt at different temperatures as they rise to the surface over time. This is a solidified lava flow over the side of a crater rim of Elysium. Credit: NASA HiRISE image, David Susko, LSU. Elysium is a giant volcanic complex on Mars, the second largest behind Olympic Mons. For scale, it rises to twice the height of Earth's Mount Everest, or approximately 16 kilometers. Geologically, however, Elysium is more like Earth's Tibesti Mountains in Chad, the Emi Koussi in particular, than Everest. This comparison is based on images of the region from the Mars Orbiter Camera, or MOC, aboard the Mars Global Surveyor, or MGS, Mission. 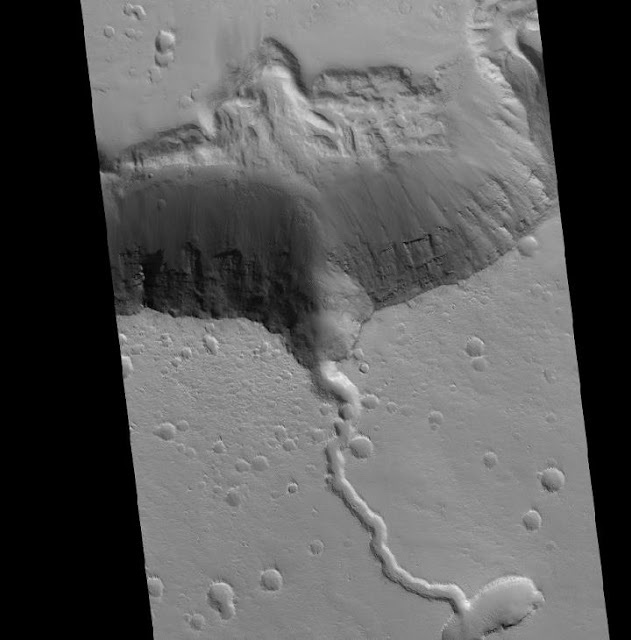 Elysium is also unique among martian volcanoes. It's isolated in the northern lowlands of the planet, whereas most other volcanic complexes on Mars cluster in the ancient southern highlands. Elysium also has patches of lava flows that are remarkably young for a planet often considered geologically silent. "Most of the volcanic features we look at on Mars are in the range of 3-4 billion years old," Susko said. "There are some patches of lava flows on Elysium that we estimate to be 3-4 million years old, so three orders of magnitude younger. In geologic timescales, 3 million years ago is like yesterday." In fact, Elysium's volcanoes hypothetically could still erupt, Susko said, although further research is needed to confirm this. "At least, we can't yet rule out active volcanoes on Mars," Susko said. "Which is very exciting." Susko's work in particular reveals that the composition of volcanoes on Mars may evolve over their eruptive history. In earlier research led by Karunatillake, assistant professor in LSU's Department of Geology and Geophysics, researchers in LSU's Planetary Science Lab, or PSL, found that particular regions of Elysium and the surrounding shallow subsurface of Mars are geochemically anomalous, strange even relative to other volcanic regions on Mars. They are depleted in the radioactive elements thorium and potassium. Elysium is one of only two igneous provinces on Mars where researchers have found such low levels of these elements so far. "Because thorium and potassium are radioactive, they are some of the most reliable geochemical signatures that we have on Mars," Susko said. "They act like beacons emitting their own gamma photons. These elements also often couple in volcanic settings on Earth." In their new paper, Susko and colleagues started to piece together the geologic history of Elysium, an expansive volcanic region on Mars characterized by strange chemistry. They sought to uncover why some of Elysium's lava flows are so geochemically unusual, or why they have such low levels of thorium and potassium. Is it because, as other researchers have suspected, glaciers located in this region long ago altered the surface chemistry through aqueous processes? Or is it because these lava flows arose from different parts of Mars' mantle than other volcanic eruptions on Mars? Perhaps the mantle has changed over time, meaning that more recent volcanic eruption flows differ chemically from older ones. If so, Susko could use Elysium's geochemical properties to study how Mars' bulk mantle has evolved over geologic time, with important insights for future missions to Mars. Understanding the evolutionary history of Mars' mantle could help researchers gain a better understanding of what kinds of valuable ores and other materials could be found in the crust, as well as whether volcanic hazards could unexpectedly threaten human missions to Mars in the near future. Mars' mantle likely has a very different history than Earth's mantle because the plate tectonics on Earth are absent on Mars as far as researchers know. The history of the bulk interior of the red planet also remains a mystery. Susko and colleagues at LSU analyzed geochemical and surface morphology data from Elysium using instruments on board NASA's Mars Odyssey Orbiter (2001) and Mars Reconnaissance Orbiter (2006). They had to account for the dust that blankets Mars' surface in the aftermath of strong dust storms, to make sure that the shallow subsurface chemistry actually reflected Elysium's igneous material and not the overlying dust. Through crater counting, the researchers found differences in age between the northwest and the southeast regions of Elysium -- about 850 million years of difference. They also found that the younger southeast regions are geochemically different from the older regions, and that these differences in fact relate to igneous processes, not secondary processes like the interaction of water or ice with the surface of Elysium in the past. "We determined that while there might have been water in this area in the past, the geochemical properties in the top meter throughout this volcanic province are indicative of igneous processes," Susko said. "We think levels of thorium and potassium here were depleted over time because of volcanic eruptions over billions of years. The radioactive elements were the first to go in the early eruptions. We are seeing changes in the mantle chemistry over time." "Long-lived volcanic systems with changing magma compositions are common on Earth, but an emerging story on Mars," said James Wray, study co-author and associate professor in the School of Earth and Atmospheric Sciences at Georgia Tech. Wray led a 2013 study that showed evidence for magma evolution at a different martian volcano, Syrtis Major, in the form of unusual minerals. But such minerals could be originating at the surface of Mars, and are visible only on rare dust-free volcanoes. "At Elysium we are truly seeing the bulk chemistry change over time, using a technique that could potentially unlock the magmatic history of many more regions across Mars," he said. Susko speculates that the very weight of Elysium's lava flows, which make up a volcanic province six times higher and almost four times wider than its morphological sister on Earth, Emi Koussi, has caused different depths of Mars' mantle to melt at different temperatures. In different regions of Elysium, lava flows may have come from different parts of the mantle. Seeing chemical differences in different regions of Elysium, Susko and colleagues concluded that Mars' mantle might be heterogeneous, with different compositions in different areas, or that it may be stratified beneath Elysium. Overall, Susko's findings indicate that Mars is a much more geologically complex body than originally thought, perhaps due to various loading effects on the mantle caused by the weight of giant volcanoes. "It's more Earth-like than moon-like," Susko said. "The moon is cut and dry. It often lacks the secondary minerals that occur on Earth due to weathering and igneous-water interactions. For decades, that's also how we envisioned Mars, as a lifeless rock, full of craters with a number of long inactive volcanoes. We had a very simple view of the red planet. But the more we look at Mars, the less moon-like it becomes. We're discovering more variety in rock types and geochemical compositions, as seen across the Curiosity Rover's traverse in Gale Crater, and more potential for viable resource utilization and capacity to sustain a human population on Mars. It's much easier to survive on a complex planetary body bearing the mineral products of complex geology than on a simpler body like the moon or asteroids." Susko plans to continue clarifying the geologic processes that cause the strange chemistry found around Elysium. In the future, he will study these chemical anomalies through computational simulations, to determine if recreating the pressures in Mars' mantle caused by the weight of giant volcanoes could affect mantle melting to yield the type of chemistry observed within Elysium.